On Tuesday, my last day of my leave of absence before my return to work (sigh) Daisy was kind enough to to let me out of the house and Danny, one of my Queens birding pals, was kind enough to agree on an expedition to two of the best birding spots on the south shore of Long Island, Jones Beach and Point Lookout. On our ride out to Nassau County we discussed our concern that we might not be able to access Jones Beach, as we had heard that the fierce three-day rainstorm had caused serious damage. While damage was caused to other locations our fears about Jones Beach were unfounded. There were signs of high water, and, indeed, the sandbar at the coast guard station was still completely underwater, but damage seemed light (though the beach itself apparently eroded quite a bit). 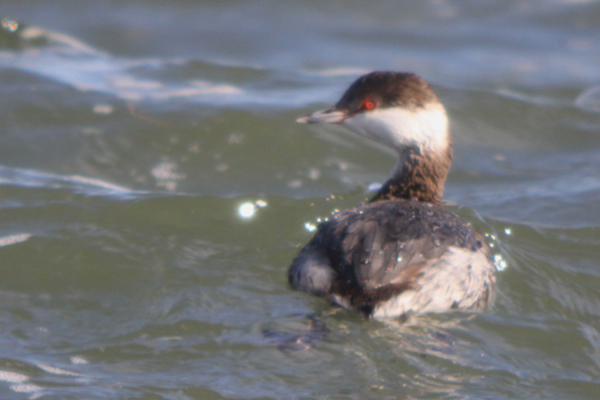 Our stop at the coast guard station was fruitful, with flocks of Red-winged Blackbirds, European Starlings, and my first-of-the-year Brown-headed Cowbirds moving through, to say nothing of the Red-breasted Mergansers, Long-tailed Ducks, Horned Grebes, Common Loons and Brant. 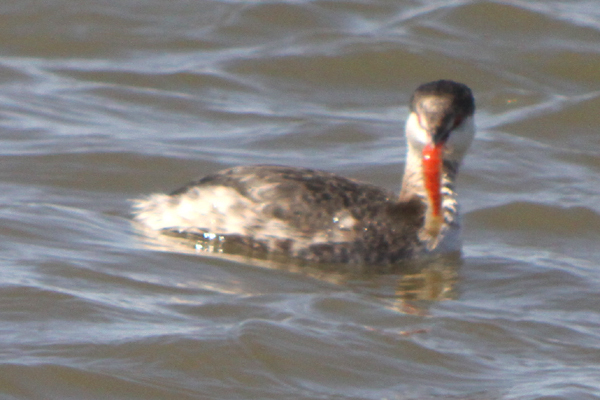 The grebes in particular were not at all shy and came as close to shore as I have ever seen Horned Grebes come. 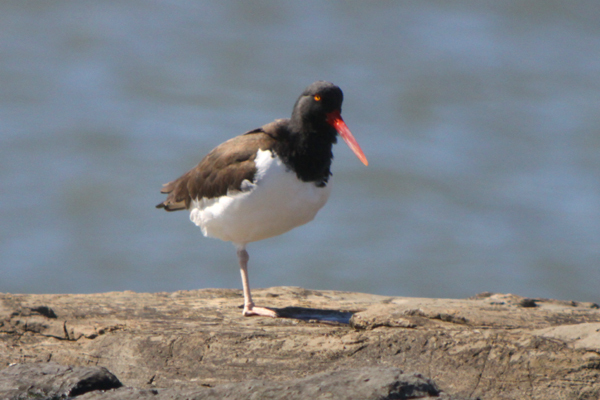 But the best birds at the coast guard station were the nine American Oystercatchers huddled up on shore, another first of the year species for me. I have to admit though, that the “gray ghost” male Northern Harrier that we spotted hunting was quite a sight as well. What both Danny and I were really hoping for was a sighting of the Lapland Longspurs that had been hanging out in the grassy area between the bathrooms and gazebo at the coast guard station for months during the winter. We didn’t see them, of course, because no twitch can ever possibly work if one waits two months to actually follow up a sighting report, but we did have fun trying to turn clods of dirt and chunks of vegetation into birds, and from generic birds into longspurs. But there is only so long one can stare at dirt and sticks before one must snap out of it and look at birds. 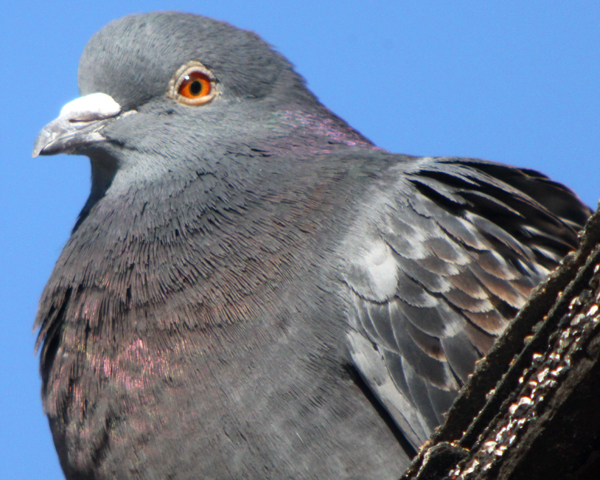 Fortunately, the resident Rock Pigeons were nearby. Sure, Rock Pigeon is a lousy substitute for Lapland Longspurs but it sure beats rocks and sticks! From the coast guard station we went and checked the gulls in the West End 2 parking lot and found them to be of the usual species. Instead of walking out to the beach there we decided to go to the nature center and walk the boardwalk and save our beach walk for Point Lookout, where we hoped to finally get Danny a view of Harlequin Ducks, which, considering he had visited Point Lookout about five times in the last couple of winters without seeing them, seem to want to avoid inclusion on his life list. 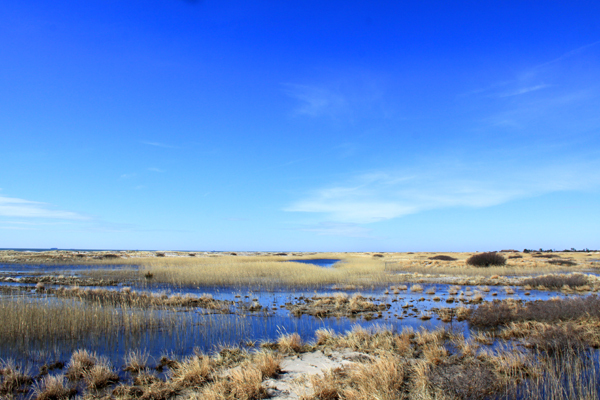 The sky was blue, the sun was shining strongly, and our walk on the Theodore Roosevelt Nature Center boardwalk was a delight, especially when we heard a Horned Lark singing and then watched it alternately forage and sing. I don’t know if I shall ever hear a more delightful sound in mid-March in a dune field than a singing Horned Lark. It really made my day. And the rain had left the dunes pocked with small ponds, ponds in which a pair of Mute Swans were apparently considering setting up shop. 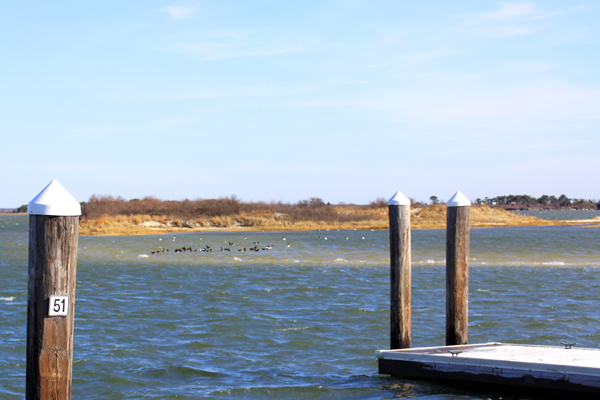 I tried to avoid the introduced swans though, and just enjoyed the gorgeous day. 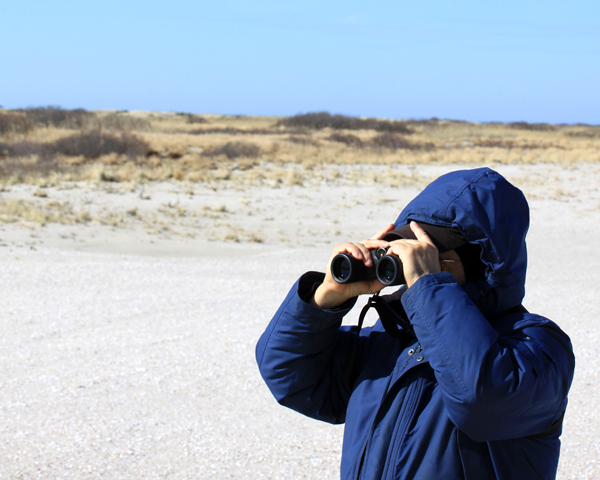 From Jones Beach the ride over to Point Lookout was quick and uneventful, though, just before we left, we spotted our first Tree Swallow of the year flying over the dunes. 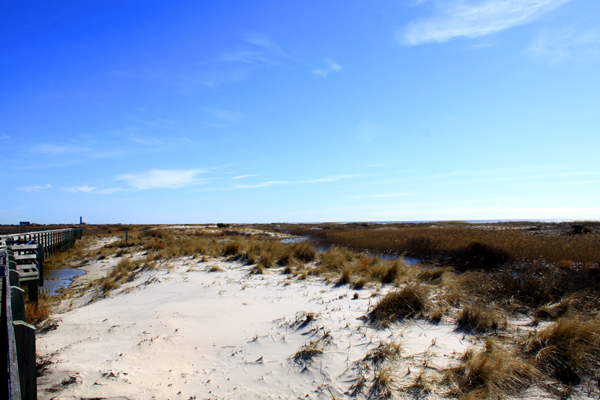 The sun still shone, and when we hopped out of the car at Point Lookout and confronted the massive dune we had to walk over to get to the beach we both thought that it looked more like we were entering the Sahara Desert than a public beach on Long Island! Our walk from jetty to jetty to jetty sadly remained Harlequin Duck-less, but we saw a horde of Horned Grebes, a flock of Dunlin, more American Oystercatchers (including the one pictured way above), Purple Sandpipers, more Long-tailed Ducks, a Sanderling, and a Red-throated Loon, among other species. Disappointed as were about the lack of harlequins, we did enjoy watching the confiding Long-tailed Ducks diving for dinner. 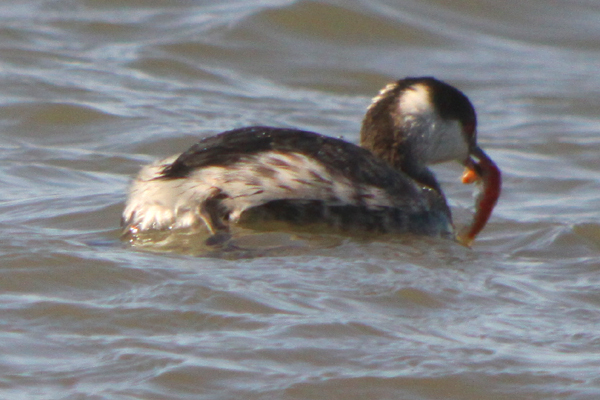 But even more interesting than the long-tails were the Horned Grebes, which I watched diving and coming up with pinkish things to eat. I couldn’t figure out what they were while I was watching, so I took a ton of pictures and I think that they mihg thave been diving for, catching, and eating shrimp. Please, if you can tell one way or another, let me know if I am right or not, because I am certainly no expert on marine invertebrates, but I think that is what I have pictures of below. After Point Lookout we headed home, happy with the birds we saw and the weather we enjoyed, but wishing we had spotted just a couple more species. In other words, it was a perfect birding outing! Sounds like a very nice day, indeed. 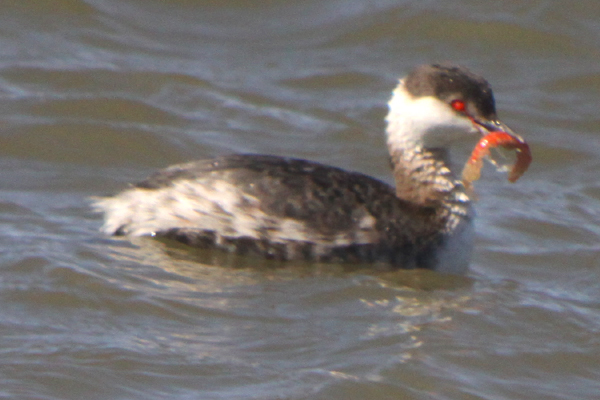 I am also not an expert on sea critters but would agree the Horned Grebes were feeding on crustaceans, shrimps. Look out for their rosy cheeks in a few days 🙂 . Ahem, just a short question. Was that “fierce three-day rainstorm” in the same category as NYC’s incredibly fierce, you-had-to be-there-to-believe-how-bad-it-was (really) blizzard not so long ago? nice birds. the summer is comming and more birds are in the sky. @Jochen: It was a very nice day…and, well, widespread flooding, trees down, power outages, and at least one fatality (from a falling tree landing on a car) over a wide swath of New York, New Jersey, and Connecticut makes me think I can call the storm fierce. At times the rain was coming down at an inch per hour (that equates to six quarceps per deciminute for those on the metric scale). @Zelina: Thanks…and we’re all looking forward to the rest of out migrants! I didn’t know there was a fatality. Otherwise I would not have commented the way I did. @Jochen: No worries; almost every storm in the metropolitan region of New York ends up killing someone (seriously). When you have tens of millions of people and bad weather at least someone is bound to either have incredibly bad luck (like having a tree or branch fall on them) or do something really stupid (those wires can’t be live, can they? ).